When you hear “street art” do you immediately think graffiti? Not so today. Yoav Litvin, in a wonderful new book, Outdoor Gallery: New York City ,presents a tantalizing collection of street art 2014. Litvin’s “art gallery” between two book covers features works exhibiting sophisticated artistry and socially relevant themes. Yoav Litvin scoured New York’s boroughs in order to document the city’s treasure trove of public art. His book is organized by artist, 46 of them to be exact. Each collection of vibrant images is accompanied by personal commentary that reveals the artist’s influences and processes, a rare and inspiring glimpse into the genius of fearless and devoted artists who work under the cover of darkness. Litvin highlights the art's many forms and wide spectrum of themes. Street art is living, breathing documentation of the zeitgeist. Images on buildings, lampposts, in doorways, playgrounds, subways, fire hydrants . . . are hard to ignore, beckoning passersby. Free, unrestricted and unprotected, the art becomes an integral part of the neighborhood aesthetic. And the relevant themes that mirror society inspire thoughtful conversation. Street artists embrace the public forum, relishing the fact that their work is freely accessible to all. Street art is not curated, protected, or collected. Its creators don’t intend for it to be bought or sold. It is, quite simply, experienced. As the neighborhood wears and weathers, so too does the art. Over time it responds to the elements just as the buildings and streets do. While most of the artists cited by Litvin also work in the studio, they value these public works above all. The connection to the “street” is an energy source. Producing a piece, freely offering it up to the public, and generating reactions are the artists’ greatest rewards. 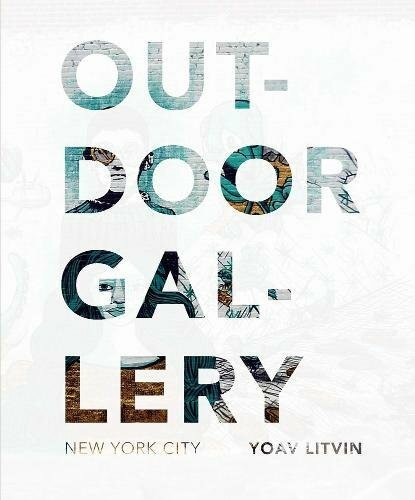 Those who don’t have the opportunity to wander the streets of Williamsburg or Bushwick Brooklyn, the Bronx, Manhattan or Astoria Queens, can experience this sensational art in Yoav Litvin’s book. Don’t be misled by the artists’ unconventional monikers: HELLBENT, ELSOL25,DAIN, ASTRODUB, TOOFLY, OCMC, GILF!, EKG, COPE2, ROYCER, FUMERO. This is a hugely talented bunch, and their work deserves to be explored more fully. Thank you, Mr. Litvin, for bringing to us the best of the urban jungle in your captivating book.